Tons of Halloween-themed creative workshops that will have children sculpting, painting, drawing, acting, and so much more! 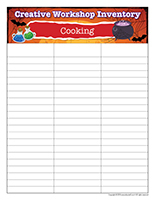 Stickers, a workshop planning chart, a workshop follow-up booklet, workshop inventory lists, and many other printable tools for Halloween fun! 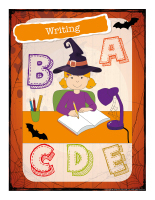 This week, the educatall team has created a series of creative workshops that you can enjoy with your group as you prepare for Halloween. For the most part, these workshops can be enjoyed both indoors or outside. You will find that this theme is packed with ideas to keep your group busy for days! 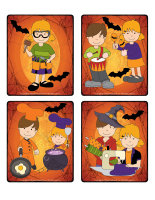 (Open thematic poster-Halloween-Creative workshops) Print, laminate, and display within your daycare where parents will see it. Pick a wall that can be used to display children’s artwork. You could, for example, write Halloween-Creative Workshops at the top. Make sure you use a wall that everyone will see, parents and children. You could also hang a simple indoor clothesline in front of your wall and use it to display drawings or other projects. Take pictures of the children in your group when they are busy being creative. Print them and display them on your wall, among their masterpieces. 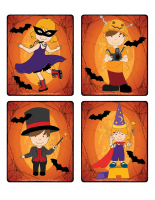 (Open stickers-Halloween-Creative workshops) Print the illustrations on adhesive paper and use them to create unique stickers. 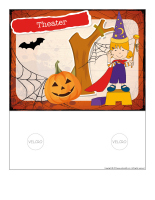 (Open educa-decorate-Halloween-Creative workshops) Print, cut out, and laminate. Use the items to decorate the walls of your daycare and set the mood for the theme. 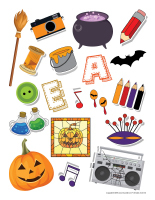 (Open educa-theme-Halloween-Creative workshops) Print and laminate the items that represent the theme. Use them to present the theme to your group (and parents) while decorating your daycare. The pictures may be used as a memory game or to spark a conversation with your group. Use them to decorate the daycare or a specific thematic corner. 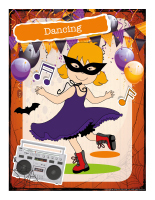 (Open picture game-Halloween-Creative workshops) Print, laminate, and store in a “Ziploc” bag or in your thematic bins. 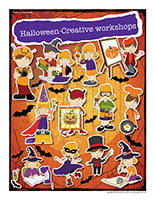 (Open poster-Halloween-Creative workshops-Painting) Print, laminate, and display to identify your workshop. 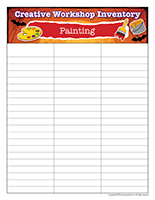 (Open inventory-Halloween-Creative workshops-Painting) Print and insert this sheet in your thematic bin. Use it to inventory the contents of your bin. Add a variety of items such as: paintbrushes (different sizes), rollers, bowls, wooden sticks, platters, aprons, ribbons, hats, color swatches and samples, etc. Dress children up to make them look like artists. They can wear old shirts with paint stains on them. Hang large pieces of paper on the walls of your daycare and set an old bedsheet on the floor. Let children paint on the paper using different tools and colors. Encourage them to use bowls to mix colors or, if you prefer, provide real paint palettes or large Styrofoam meat platters. Simply cut a thumbhole out of each one so children can hold them like real artists. (Open planning chart-Halloween-Creative workshops) Print, laminate, and use with a dry-erase marker so you can use this chart year after year. This indispensable tool will help you prepare and create the material needed for the workshops you wish to offer. It will also simplify the organization of your environment and help you plan per children’s interests. What’s more, you can use the chart to assess and analyze the activities you present on a daily or weekly basis. 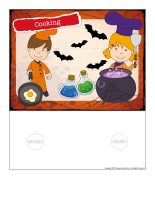 (Open follow-up booklet-Halloween-Creative workshops) Print for each child. 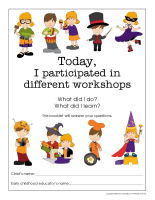 This follow-up booklet will help you gain a better understanding of what children are learning in each workshop. Plan a workshop where children can mix two colors together (orange and black) to see what happens. You can also provide them with the opportunity to mix two primary colors and explain how once they are well blended together, they will have created a secondary color (ex. blue+yellow=green). Variation: Have fun applying a small amount of red paint to the tip of one of your fingers (or your entire palm) and applying a small amount of yellow paint to the tip of a child’s finger (or entire palm). Press your fingers or palms together to see orange appear. Have children paint on colorful paper. Try to provide paint colors that will create a bold contrast. For example, use white paint on black or dark blue paper. Orange paint will really pop when used on bright blue paper. Invite children to paint with their feet. To create their masterpiece, they will have to hold a paintbrush with their toes instead of their fingers. They can also press their feet in paint and then on the paper. With their toes pointing downwards, their footprints will look a lot like ghosts. Enjoy a finger painting workshop. Provide tactile paper and several finger paint colors. Let children paint freely. Plan a rainbow-colored workshop. Encourage children to use rainbow-colored waxed crayons on tactile paper. When they are done, have them paint all over their paper with black paint. Set their work aside to dry. Once it dry, show them how they can use the wooden tip of a paintbrush to scratch the paint and reveal the rainbow colors. Little painters will love this workshop. Fill buckets with water and provide big paintbrushes (used to paint walls). Children will have fun painting various structures in your yard (fences, play structures, tables, benches, etc.). Prepare the necessary material for a workshop in which children will have fun painting on fabric. Encourage children to paint on pillowcases, a sweater, felt, etc. Invite them to paint a Halloween-related character or item. For this workshop, you will need small pieces of wood that are lightweight. Use a drill to create a hole at the top of each one, big enough to thread a ribbon or string through it. Let children paint freely on the pieces of wood. This creative workshop involves many steps. Go for a walk with your group and ask each child to find a rock. Let them wash their rock and set them all out to dry in the sun. Once dry, children paint their rock. Provide several different paint colors as well as a huge piece of cardboard. Let children use paintbrushes to paint on the cardboard. They can mix colors to create spectacular Halloween fireworks. Freeze orange and black paint in ice cube trays. Insert a wooden stick in each section. Children will love painting with these homemade paint blocks. Let them use these unique painting tools to express their creativity. Organize a fun mud painting workshop. With your group, use small shovels to fill a bin with dirt or sand. Add water and stir to create mud. Provide paintbrushes and let them paint with the mud. When they are done, use a hose to wash their muddy designs away. Plan a sand painting workshop. Have children mix sand into several colors of poster paint. Divide the colors among several empty dishwashing liquid bottles. 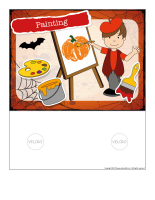 Children will enjoy squeezing the sand paint onto paper to create fun Halloween designs. 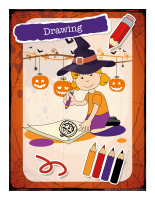 (Open poster-Halloween-Creative workshops-Drawing) Print, laminate, and display to identify your workshop. 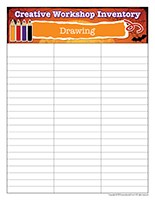 (Open inventory-Halloween-Creative workshops-Drawing) Print and insert this sheet in your thematic bin. Use it to inventory the contents of your bin. Add a variety of items such as: crayons, chalk, markers, notebooks, chalkboards or dry-erase boards, stamps, stamp pads, papers, pens, stencils, Halloween coloring pages, etc. Focus on one color at a time. Provide different types of crayons and pencils, but all in the same color. 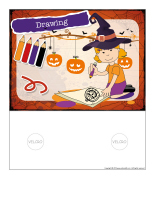 Invite children to draw on Halloween-themed paper. Display their work on a wall. Have children sit in a circle. Give one child a piece of paper and crayons. Invite him to draw on the paper while you play Halloween music. When the music stops, the child must stop drawing and hand the paper and crayons to the child sitting next to him. This second child continues the drawing until the music stops again and so on. The result is always fun to see! For this workshop, provide Halloween papers and crayons. Set a timer for 5 minutes. When you say “go”, children begin drawing. When the timer rings, they must stop drawing, even if they are not done. Let each child present his drawing to the group. 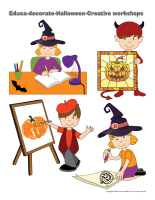 Print several Halloween-themed coloring pages in the educatall club and let children color them freely using waxed crayons, wooden coloring pencils, markers, etc. Mandalas foster concentration. You will find several mandalas in the educatall club. Print the ones you prefer and set the on a table. Children can color them whenever they feel they need to relax. A workshop to help children understand if they are righthanded or lefthanded. Begin by showing children how they have a left hand and a right hand. Ask them to draw something using their left hand and then with their right hand. You may use two pieces of paper per child or, divide one sheet of paper into two equal sections. Write on each paper or section which hand children used to draw. 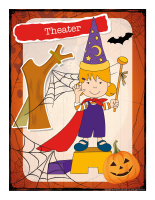 (Open poster-Halloween-Creative workshops-Theater) Print, laminate, and display to identify your workshop. 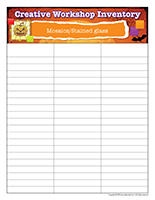 (Open inventory-Halloween-Creative workshops-Theater) Print and insert this sheet in your thematic bin. Use it to inventory the contents of your bin. Add a variety of items such as: old clothing items, wigs, hooks for hats, baseball caps, scarves, jewellery, costumes, baskets, etc. You can also create a special theater area using a large cardboard box. Paint and decorate it with your group to make it look like a stage. You may hang tiny Christmas lights in it. Add curtains and make sure there is a mirror nearby so children can admire their theatrical outfits and faces. You could have fun practicing a short play or acting out the lyrics of a song with your group. Theater is a great way to foster all aspects of childhood development. 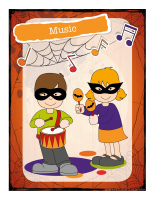 Encourage children to invent and practice a short Halloween show or play. Plan a workshop around mimes. Explain to your group what a mime is and invite them to pretend they are going up or down stairs, pulling on a rope, climbing a tree, walking in the forest, etc. Explore shadow puppets with your group. Hang a large white bedsheet from the ceiling. Show children how they can represent animals (ex. frog). They will have fun guessing what different shadows represent. You can use your hands or cut shapes out of cardboard and glue Popsicle sticks or wooden skewers behind them to make holding them easier. Provide face paints and makeup and enjoy a Halloween face painting workshop with your group. Encourage children to team up with a friend. They will have fun painting their partner’s face. Improvisation workshop. Depending on the ages of the children in your group, explore short sketches children can act out. Role play workshop. Set an easel, a paint palette, a few paint samples, coloring pages, and paintbrushes in your theater area. Add a beret and a scarf that children can wear. They can take turns pretending they are well-known artists. 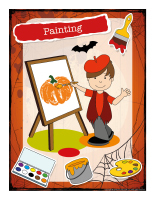 Encourage them to create pretend Halloween-related masterpieces. Let each child present his work to the group. 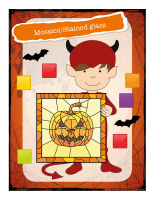 (Open poster-Halloween-Creative workshops-Mosaics/Stained glass) Print, laminate, and display to identify your workshop. 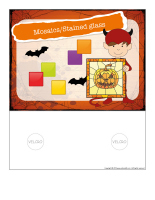 (Open inventory-Halloween-Creative workshops-Mosaics/Stained glass) Print and insert this sheet in your thematic bin. Use it to inventory the contents of your bin. Add a variety of items such as: crayons, chalk, markers, notebooks, chalkboards or dry-erase boards, stamps, stamp pads, papers, pens, stencils, Halloween coloring pages, stickers, Fun Foam shapes, etc. Halloween mandalas. 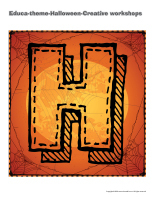 (Open mandalas-Halloween) Print for each child and encourage your group to color the mandalas using Halloween colors. Plan a creative workshop where children represent a mosaic using Jell-O cubes. Prepare four packages of Jell-O using containers large enough for the preparation to be approximately 1 cm thick. Once the Jell-O is set, cut it into squares. For dessert, invite children to form a mosaic by arranging four Jell-O squares (different colors) on a plate. Serve cookies and milk with their edible mosaic. Cut several square pieces of tissue paper (different colors). Using “Mod Podge” or diluted white glue, let children glue the pieces of paper on clear paper, overlapping them. Let dry and display their mosaics in a window for everyone to admire. Grate old waxed crayons, dividing colors. Have children sprinkle the pieces of grated wax on waxed paper. Cover them with a second piece of waxed paper. Use an iron to melt the wax. Cut shapes out of the waxed paper and hang them in front of a window. 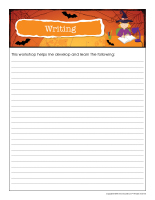 (Open poster-Halloween-Creative workshops-Writing) Print, laminate, and display to identify your workshop. (Open inventory-Halloween-Creative workshops-Writing) Print and insert this sheet in your thematic bin. Use it to inventory the contents of your bin. Add a variety of items such as: notebooks, chalkboards, stamps, stamp pads, chalk, pencils, crayons, pens, activity sheets related to the theme, etc. 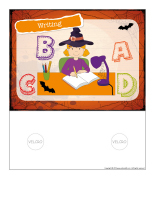 In preparation for this workshop, print and laminate the following document (Open word flashcards-Halloween). Set the flashcards in the centre of your parachute or on a blanket. Children hold on to the edges and when you give the signal, raise the parachute to send the flashcards flying in the air. 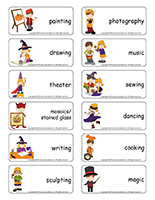 As the word flashcards fall back down, children collect them and have fun trying to “read” the words. To plan this workshop, ask children to tear pictures they like out of a Halloween coloring book. They could also tear pictures out of old, damaged storybooks. Cut the text portion if you are using illustrations from storybooks. With your group, arrange the illustrations in a row, as you wish. Encourage children to invent the story that could accompany the sequence of illustrations. Write their text below each illustration. Photocopy the illustrations and the text and help children use ribbon to create a book. Send a copy of your group’s original story home with each child at the end of the day. 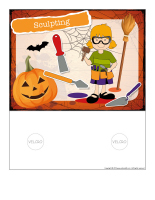 (Open poster-Halloween-Creative workshops-Sculpting) Print, laminate, and display to identify your workshop. (Open inventory-Halloween-Creative workshops-Sculpting) Print and insert this sheet in your thematic bin. Use it to inventory the contents of your bin. Add a variety of items such as: modeling dough, cookie cutters, kitchen utensils, aprons, oven mitts, utensils, cake pans, rolling pins, flour, a sugar bowl, an egg beater, wooden spoons, measuring cups, measuring spoons, etc. You will need uncooked spaghetti and miniature marshmallows. Ask children to use them to create all kinds of Halloween sculptures. Display their creations. Provide black and orange modeling dough. Set the dough in the center of the table and invite children to create different Halloween sculptures together. Provide salt dough. Let children create Halloween sculptures. Set them out to dry and invite children to paint them. Set a large container filled with water and dirt on the floor. Children will enjoy manipulating the mud with their hands and using it to sculpt various Halloween characters. Jell-O sculpting. Let children manipulate the contents of a bin filled with orange Jell-O cubes. Let them try to sculpt the Jell-O. Clay sculptures. Give each child a small block of clay and let them sculpt simple Halloween shapes, a pencil holder, a small plate… Let dry. Ecological sculptures. Using recycled items (metal cans, yogurt containers, empty toilet paper rolls, bread ties, etc. 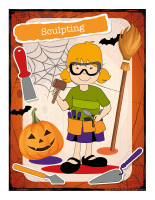 ), encourage children to create a Halloween sculpture. Help them hold the items together with hot glue or any other adhesive. You can decide to have them work together to create one large sculpture or each child can sculpt his own. Display their work. Children enjoy manipulating different objects that can be used to make impressions in modeling dough. With them, experiment with different fabrics such as denim or burlap. The top of a shoe, tree leaves, and large stampers are also interesting for this activity. 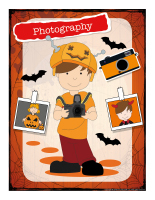 (Open poster-Halloween-Creative workshops-Photography) Print, laminate, and display to identify your workshop. 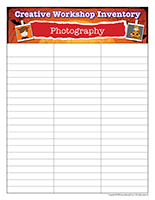 (Open inventory-Halloween-Creative workshops-Photography) Print and insert this sheet in your thematic bin. Use it to inventory the contents of your bin. Add a variety of items such as: toy cameras, photo albums, old pictures, bedsheets and posters (for creating backgrounds), etc. For this workshop, ask parents for pictures from past Halloweens. Cut the pictures and glue them on 10 cm x 13 cm pieces of paper. Arrange the pictures in plastic Ziploc bags. You can insert two pictures back to back in each bag. Staple the bags together at the sealed end so you can open them if necessary. Use colorful adhesive tape to cove the staples. Let children manipulate this original photo album. Set a mirror in your dress-up area. Add several hats, masks, necklaces, and other accessories children can use to create unique characters. If possible, photograph your group when they are all dressed up, print the pictures, and display them. 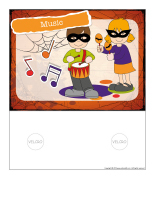 (Open poster-Halloween-Creative workshops-Music) Print, laminate, and display to identify your workshop. (Open inventory-Halloween-Creative workshops-Music) Print and insert this sheet in your thematic bin. Use it to inventory the contents of your bin. Add a variety of items such as: musical instruments, microphones, costumes, a mirror, a tape recorder, songbooks, sheet music, etc. For this creative workshop, ask a child to pick a song he knows and hum the first line. If that isn’t enough for the others to guess the song, encourage him to continue. You may also be the one who hums a song for your group. For this workshop, record the children in your group individually. They can sing or speak. Play back the recordings and encourage children to identify each voice. Variation: Encourage children to make monster sounds with their voice. Give each child a scarf. Alternate between playing soft and very fast-paced music. Encourage children to move the scarves to the beat of the music. Show children how they can toss their scarf in the air, spin it around in circles, etc. Invite children to stand in a circle holding their scarves instead of holding hands. They can trade scarves every time the music stops. 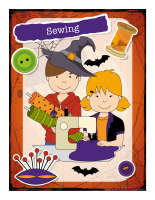 (Open poster-Halloween-Creative workshops-Sewing) Print, laminate, and display to identify your workshop. 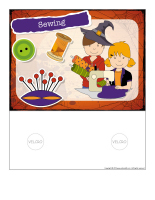 (Open inventory-Halloween-Creative workshops-Sewing) Print and insert this sheet in your thematic bin. Use it to inventory the contents of your bin. Add a variety of items such as: different colors of thread, empty spools, rulers, chalk, buttons, fabric, elastic, tracing paper, clothing items, a toy sewing machine, plastic needles, sewing kits, Velcro, scissors, zippers, catalogues, thimbles, etc. Shoe designer workshop. Give each child two empty shoeboxes and let them use the boxes to design unique shoes. Help them punch two series of three or four holes out of each box using a hole-punch. They can thread shoelaces through the holes. Provide a variety of materials children can use to decorate their shoes. Variation: Ask children to bring an old shoe to daycare and let them paint and decorate it. They can add wiggly eyes, feathers, buttons, etc. Display children’s creations on a shelf. 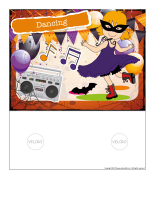 (Open poster-Halloween-Creative workshops-Dancing) Print, laminate, and display to identify your workshop. 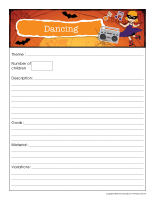 (Open inventory-Halloween-Creative workshops-Dancing) Print and insert this sheet in your thematic bin. Use it to inventory the contents of your bin. Add a variety of items such as: ribbons, scarves, hula hoops, music, ballet slippers, tap shoes, a mirror, tutus, dresses, hats, etc. Creative dancing workshop. Play traditional music and show children a few line dancing moves. 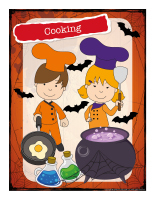 (Open poster-Halloween-Creative workshops-Cooking) Print, laminate, and display to identify your workshop. 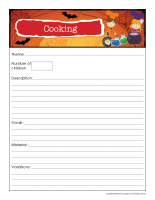 (Open inventory-Halloween-Creative workshops-Cooking) Print and insert this sheet in your thematic bin. Use it to inventory the contents of your bin. Add a variety of items such as: plastic dishes, plastic utensils, wooden spoons, cutting boards, funnels, sieves, plastic food items, a kitchen scale, refrigerator magnets, felt fruits and vegetables, scented markers and modeling dough, oven mitts, tablecloths, placemats, aprons, chef hats, empty food containers, etc. Find items normally used in the kitchen that can be used to make music. Use pots and pans as drums with wooden spoons. Fill jars with water and tap them with metal spoons, etc. This is a simple rhythmic workshop. Bakery role play workshop. Provide utensils, white modeling dough, rolling pins, placemats, bread pans, baker hats, cookie cutters, etc. Let children pretend they are bakers. 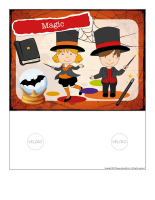 (Open poster-Halloween-Creative workshops-Magic) Print, laminate, and display to identify your workshop. (Open inventory-Halloween-Creative workshops-Magic) Print and insert this sheet in your thematic bin. Use it to inventory the contents of your bin. Add a variety of items such as: magician hats, magic wands, stuffed rabbits, star-shaped cookie cutters for cutting stars out of contruction paper, etc. Design an obstacle course that children must complete in the dark. Set different items that children can collect along the course. 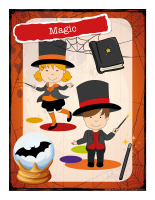 Try to find items related to magic such as a wand, a magician’s hat, a rabbit, a bird, a playing card, etc. During this creative workshop, organize a treasure hunt where children must find the ingredients of the magician’s magic potion. Set a variety of objects on the table (a star, a magic wand, etc.). Children observe the items for one minute. Cover them with a dark blanket and remove one or two things. Pull the blanket away and have children identify the missing object(s).